Back around July 1969, four Frankston residents got together following the Apollo 11's landing on the Moon, and set about creating the Astronomical Society of Frankston (ASF). 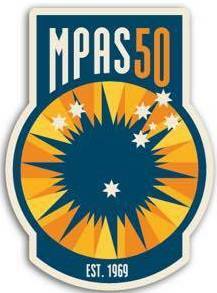 In January 2004, it changed its name to the Mornington Peninsula Astronomical Society (MPAS). Now, more than 30 years later, the Society has over 150 members, making it the second-largest in Victoria. Most of the members still come from Frankston or the Mornington Peninsula. When the MPAS was formed, the members initially held the meetings in the Jubilee Park Hall. Not long after, the location moved to Frankston High School. In 1976, the meeting venue moved again, this time to the Teachers College (now the Frankston Campus of Monash Uni). Eventually, when Monash took over the College, the location for the meetings became the Peninsula School at Mt Eliza, where it continues today. Like the meeting venues, there have been a few observatories (located with our meeting sites), and that to be built at the Briars will be our fourth. The first was a fibreglass dome for the Frankston High School, around 1972, but this was burnt down. The second, a metal roll off roof observatory, containing the B.J.Smith 12.5-inch telescope, was built at the Teachers College, but was dismantled when Monash took over. The third was at the Peninsula School, but was later removed to make way for a footy oval. The result of all this was that we went into the "Astronomy on the Move" concept. The first astronomical society to go mobile in Australia. Around the time that I joined in 1990, the Society began viewing from the Moorooduc Airfield (the result of an MPAS member also being in the Moorooduc Flying Club). However, the airfield was later closed, and about 1994 the MPAS started viewing at The Briars. Initially, we just observed from grass, and later, a gravel area. More recently, three concrete slabs were laid, with a storage shed being constructed on the smallest slab. Of the other two, one is used for observing, while the first stage of the observatory building has been constructed on the other. A number of native trees have also been planted around the site to act as windbreaks and block light. Both water and power have now been connected to the site. Plans have also been drawn up for extensions to the observatory building. The 2001 Christmas BBQ also saw a time capsule being placed beneath the bottom slab, to be reopened in 50 years time. Who knows what the site will look like then? The MPAS also has a long term commitment to the local education system, and public displays. This consists of an active program of holding viewing nights for both the public and schools. Many of the public nights were originally at Ballam Park at Frankston, but they are now at The Briars. Others have also been held at Braeside Park in the north, and at Rosebud and Arthurs Seat in the south. The school nights have been held all around the Mornington Peninsula and southeast suburbs, from Rosebud in the south to Dandenong in the north. More recent features for members include "E-Scorpius", a members-only email list, and an Aurora Network, allowing members who sight aurorae to pass the news on to other members in the network. The Telescope Learning Days ("TLDs") which were started earlier this year, have proved quite successful at encouraging newer members to get to know their telescopes, and also increasing the number of members coming to the Briars site. The completion of a large shed at the Briars in late 2005 will allow more to be done at the Briars site. Over Easter 2006, the MPAS hosted NACAA again in Frankston, this time by itself (in 1990, it had hosted NACAA in conjunction with the ASV).